NHD Clothing items are back in stock for preorders! For those of you who haven’t been keeping up to date with the happenings over here at Nick Hammond Design we recently launched our clothing line entitled “NHD Clothing.” The first release was so hot the items went off the shelves like hot cakes as we added multiple memeber’s to our sponsored NHD Team tab. Since then our paintball players, handballs players, athletes and Bands have been accomplishing some amazing stuff. Well now here it is, YOUR time to get in on the action. NHD Clothing items are officially back up on the site for preorder in preparation for our second shipment. The last batch went so fast you’d be a fool not to order now since, once the entire shipment comes in, the shirts will sell out faster than you can say “I love Nick Hammond Design.” Judging by the pic provided above, numbers don’t lie. With over 3,000 people coming to our store from just the United States you won’t want to miss out on wearing your NHD threads. 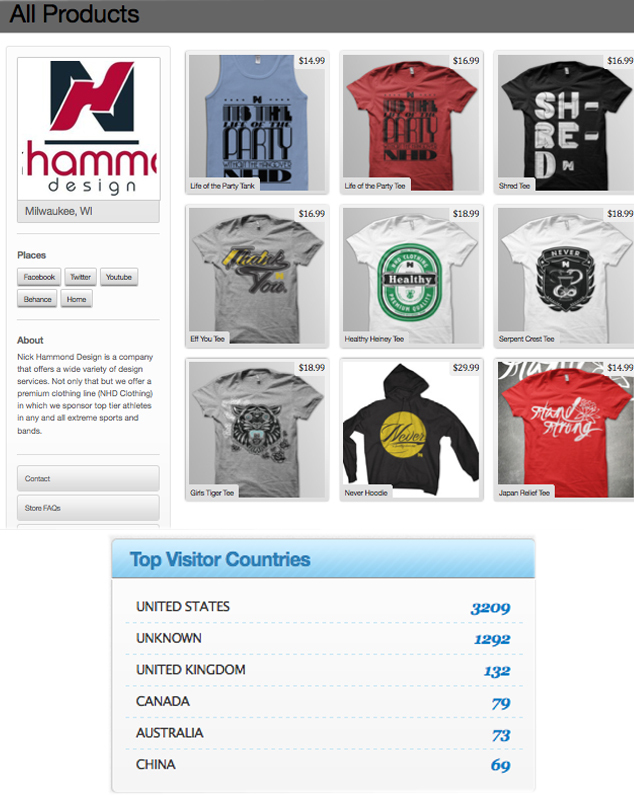 Check out those numbers from across the world as well to get a glimpse of how many people actively view our products. Head on over to our STORE page to get your slick NHD Clothing now!